a) The entire Implanova® prosthetic system uses the exact same screw type. The length of the screw head varies depending on the indication. All final abutment/restorations must be torqued to 20Ncm using an Implanova® prosthetic torque wrench. Please note that for the final restoration, the screw/abutment must be re-torqued to 20Ncm at least 10mins after the initial torqueing. If any preparations is made on the final abutment/restoration the screw/abutment must be torqued again. A single ISO hex driver is used for all prosthetic parts. 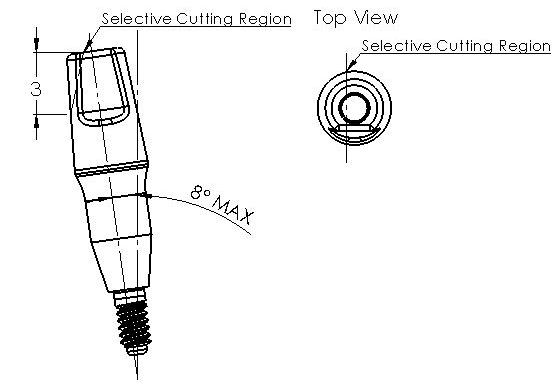 b) All Implanova abutments can be modified for suitable height and margin position by a carbide bur or diamond abrasive in a high speed hand piece with copious water. Final height should not be less than 4mm to secure adequate retention of crowns. The margin can be dropped down up to 1mm without reduction of diameter. c) All Implanova® abutments utilize the conical, 11° tapered body design to ensure tight, uniform sealing with the internal surfaces of the implant. The abutment can be placed either at the time of surgical placement of the implant fixture if initial stability is sufficient or at a later date after the implant is integrated. As an alternative, a healing cap can be placed at the time of implant placement and can be replaced with the appropriate abutment after implant integration. d) All Implanova® abutment components are made up of Grade 23 Titanium alloy (Ti-6Al-4V ELI) per ASTM F136. e) Implanova medium height abutments are typically suitable for subcrestal placed implants. Short abutments are for crestal placed implants. f) Implanova abutments that are designated as unibutments are those that do not have any platform on themselves and the emergence profile is created by the restoration. g) Implanova® abutments come in seven forms. Straight abutments come in solid, one-piece or two-piece Contoured Shoulder abutments. Solid abutments have an integrated external thread that is designed to be directly fastened into the Implanova® implant fixture without the need of an additional screw. All Implanova® Angled unibutments and Contoured Shoulder abutments attach to the Implanova® bone level implant fixture using a single size, universal abutment screw. All Implanova® abutments are compatible with and fit all Implanova® implant sizes. Note: Angled abutments should not be used with 3mm implants. This includes TiTACHTM abutments and angled FRIDGE® unibutments. Straight Solid Prepable Abutments are single piece, solid abutments that are designed to be used in parallelism with a placed implant fixture. Straight abutments are available in 3 diameters – Narrow (4.1mm), Standard (4.8mm), and Wide (6.5mm). They are selected based on the available space between the two adjacent teeth and the type of restoration to be used. For each abutment diameter, there are 3 different neck lengths available – Short (1.7mm), Medium (3.1mm), and Long (4.6mm) – which are designed to be used with crestal, subcrestal (1-2mm), and way subcrestal (2-3mm) implant placement levels, respectively. Due to a thick, meaty abutment center, all Straight abutments are prepable by the practitioner for specific height and shoulder positions. Straight abutments feature a single, hexagonal socket size that is universal to the Implanova® implant system and compatible with the Pick ‘Em Up™ Hex Drivers. Implanova® Straight abutments should be placed manually or at 20 rpm with a torque of 20 Ncm. 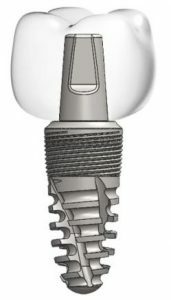 Note: Solid abutments are ideal to be used in two or more adjacent implants. In this case, the chance of screw loosening would be practically zero. Solid abutments are not recommended as single unit restorations as occlusal forces may loosen abutment-restoration unit. Caution: Once the abutment is screwed on the implant, it may become impossible to unscrew the abutment without unscrewing the implant with even as low as 5 N-cm force, unless the implant is integrated (6 weeks out). Therefore, if you are placing the abutment at the time of initial placement, make sure the implant is secured (larger than 30 N-cm insertion torque) and you have the correct diameter and neck length for abutment selection. Straight Solid Prepable Unibutments are specially made for the FRIDGE®. They come in three neck lengths: Short, Medium, and Long. They are not suitable for individual restorations. When used for FRIDGE system up to 1/3 of one side can be prepped away to help the seating of the friction cap. However, the height of the unibutment must not be reduced any further as the abutment is at its minimum height. As the name implies, Implanova® sub-crestal implants are meant to be placed at sub-crestal level. Occasionally, the top of the implant becomes exposed through the mucosa. Therefore, it does not allow platform switching of regular abutments. The rescue abutments are made to facilitate the restoration of these implants. A single rescue abutment fits all the implant diameters.